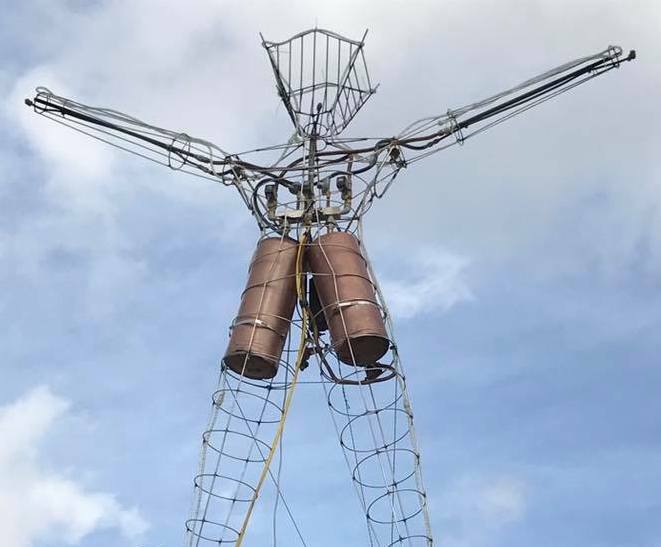 In 2013 the YOUtopia Art Curation team provided a grant to build Mini Man, a scaled down wooden replica of the Burning Man effigy created by Boone Brabon. 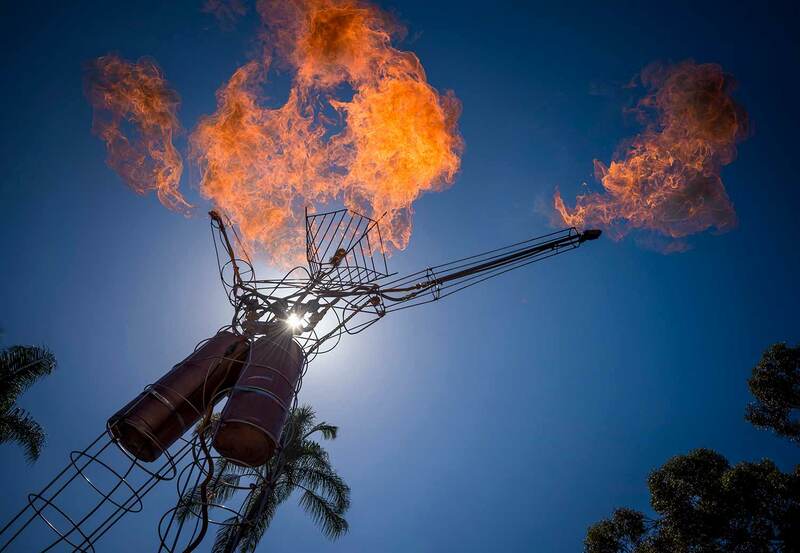 This iconic symbol greeted participants at our regional event for several years and was perched on top of CoLab when not being used for other events like on the Burner float for the SD Pride parade. After much use and several repairs it was time to start thinking about an upgrade that would provide longevity and the desire for…FIRE! SDCAP started taking proposals for Mini Man 2.0 in early 2016 and approved a grant to the team of Brock Landers, Wylie Weldy, Dawn Sardinas and several others. After months of design and fabrication Mini Man 2.0 made his debut at the SD Maker Faire during a press conference. 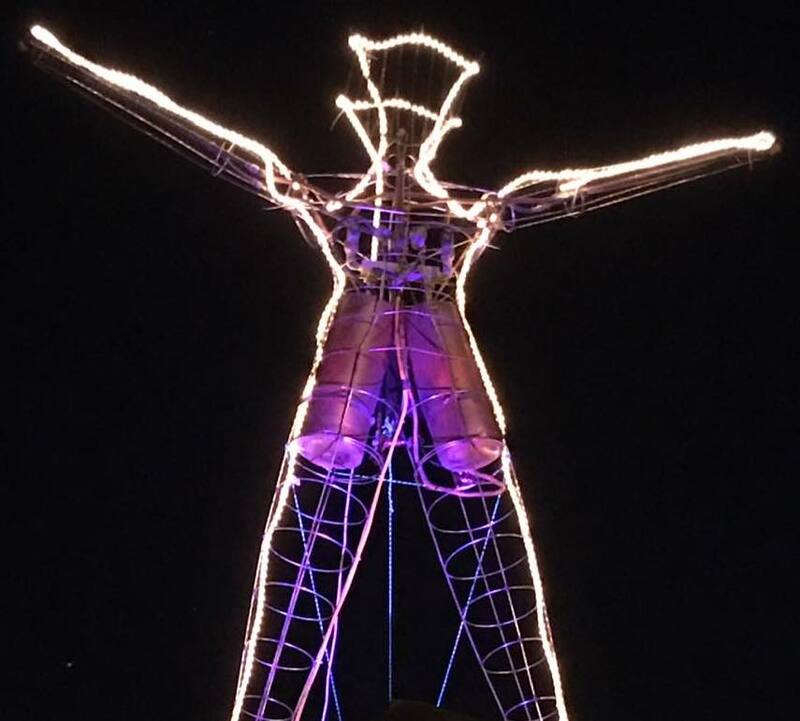 He then made his community debut at YOUtopia 2016 and delighted participants as they entered the gate with fire that “poofed” into the dark sky. Mini Man 2.0 is not just a symbol but also an interactive piece that allows people to play with fire elements that are usually just witnessed. During YOUtopia we allowed several participants, as they wandered by, the opportunity to take control and it was wonderful to see them dance with joy as they sent flames shooting upward! 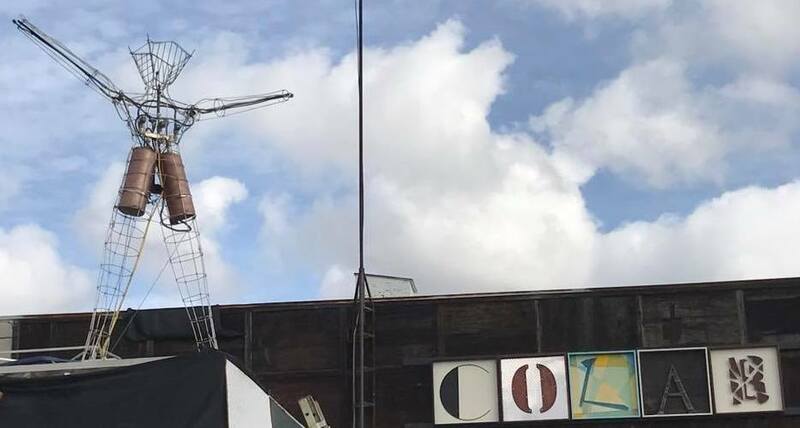 Mini Man 2.0 has now climbed on top of the roof at CoLab and greets all of us as we enter to build art, have meetings, gather as community, do fundraisers and host events. Knowing that Mini Man 2.0 will be around for many years to come this was not just a worthy endeavor but a reminder of what we can do when we create…together. Thank you to all who participated and well done! MINUTES OF A MEETING of the Board of Directors of the Corporation (the “Board’) held on the 14th day of December, 2016 at 7:00 p.m. at Colab in San Diego, California. As regular Board meetings do not require notice to the Board pursuant to the Corporation’s Bylaws, President Colin Jemmott acted as Chairman of the meeting and Lisa Walden acted as Secretary. ON MOTION DULY MADE, SECONDED AND CARRIED, IT WAS RESOLVED THAT the minutes of the meeting of the Board held on 11/30/16 be approved. MINUTES OF A MEETING of the Board of Directors of the Corporation (the “Board’) held on the 30th day of November, 2016 at 7:00 p.m. at Colab in San Diego, California. ON MOTION DULY MADE BY DOMINIC MORETTO, SECONDED AND CARRIED, IT WAS RESOLVED THAT the minutes of the meeting of the Board held on 11/9/16 be approved. President’s Report – Youtopia Volunteer party 12/3/16. ON MOTION DULY MADE BY COLIN JEMMOTT, SECONDED AND CARRIED, IT WAS RESOLVED THAT Jake Holler shall be removed from SDCAP credit card account and Sean Nash added to same account. There being no further business, ON MOTION DULY MADE, SECONDED AND CARRIED, the meeting was adjourned at 8:34 PM. MINUTES OF A MEETING of the Board of Directors of the Corporation (the “Board’) held on the 9th day of November, 2016 at 7:00 p.m. at Colab in San Diego, California. Board Members Present: Cassy Haynes (arrived approximately 7:20), Curt Benedetto, Paul McCarthy, Stephanie Cucurullo, Colin Jemmott, Greg Davidson, Dominic Moretto, Jake Holler and Lisa Walden. ON MOTION DULY MADE BY STEPHANIE CUCURULLO, SECONDED AND CARRIED, IT WAS RESOLVED THAT the minutes of the meeting of the Board held on 10/26/16 be approved. Producer selection discussion/interview of Sean (Natural) Nash. Leads team to be contacted regarding producer selection; If such objection is raised within 7 days of notification to leads, Board will revisit issue and selection. ON MOTION DULY MADE BY STEPHANIE CUCURULLO, SECONDED AND CARRIED, IT WAS RESOLVED THAT the Board confirm the appointment of Jon Ray and Sean “Natural” Nash as the Co-Producers of Youtopia 2017, pending lack of sufficient objection from Youtopia leads team. There being no further business, ON MOTION DULY MADE, SECONDED AND CARRIED, the meeting was adjourned at 9:06 PM.